The Short Version: For professionals who are hyper-focused on their careers, finding the time to cultivate romantic connections can often seem like an insurmountable task. That’s why they turn to the luxury matchmaking company Seventy Thirty. CEO and Founder Susie Ambrose takes a concierge approach to matching elite singles all over the world, and she has an impressive 85% success rate. For nearly two decades, Susie and her team of highly qualified psychologists and relationship experts have been working hands-on with 10,000-plus men and women to help them foster bonds and cement lasting relationships. While running her psychotherapy practice, Susie Ambrose started to see a trend with some of her clients. Despite the fact that many of them were wealthy, successful, and attractive, they were still single. Often their inability to form meaningful relationships was the direct result of their busy, work-focused lifestyles. One aristocratic man specifically came to Susie looking for love. She decided to help him and soon after matched him with a woman he came to love and respect. It was this first success story that drove Susie to create Seventy Thirty. The company’s name derives from a study Susie found that reveals that successful people spend 70% of their time working, leaving only the remaining 30% for socializing. Founded in 2001, Seventy Thirty was one of the first matchmaking companies for single professionals. 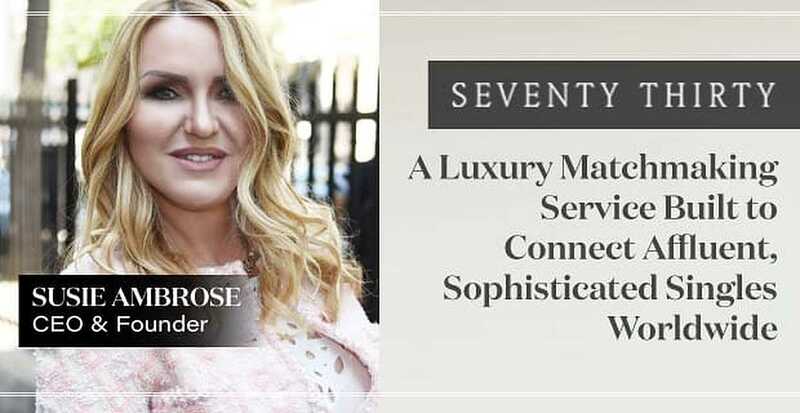 “Seventy Thirty was born out of the genuine need to address that imbalance, creating a lifestyle that is fulfilling and relationships for people who have reached what should be a level of success and wealth with which they are satisfied,” Susie said. As CEO and Founder, Susie has surrounded herself with a team of psychologists and relationship experts to help cater to affluent clientele. Founded in 2001, Seventy Thirty was among the first exclusive, luxury matchmaking companies. And her book also titled “Seven Thirty” provides a smart, insightful glimpse into what makes human relationships tick. Using her background in psychology, Susie developed a personal and professional matchmaking technique that has proven to be very effective, with an 85% success rate. “By guaranteeing that each member has a matchmaker who handpicks potential partners and helping the member be the person they want to be through life services, such as image counseling and relationship coaching, Seventy Thirty significantly increases the member chances of a long-term relationship,” she said. Seventy Thirty focuses on long-term connection and compatibility rather than short-lived infatuation or attraction, and that’s what makes Susie’s method so effective. The team at Seventy Thirty uses more than just your standard matchmaking techniques for their clientele — they use proven psychological methodologies to match potential partners. There’s no signing up and searching. Once you become a member, a personal account manager ensures you get the most hands-on level of service. Personal account managers work diligently to find a match who checks all the boxes, and then they’ll set up introductions. The difference between Seventy Thirty and other matchmaking companies comes down to one key ingredient: client focus. In fact, many potential clients charter flights to London just to meet Susie and her team. Susie and her team of experts provide a hands-on approach to finding the right match for you. Most clients come for Seventy Thirty’s primary service: matchmaking. Thanks to the company’s attention to a personal and bespoke experience for each client, success rates soar. Clients can feel comfortable in knowing their dates come pre-vetted. This gives wealthy clients the security to know they’re dating someone within their own peer group. Seventy Thirty’s matchmakers consider many important factors when arranging an introduction. They weigh what is right for a client in the long term versus what looks attractive at the moment. Susie told us that, rather than being strictly surface-based, her clients are looking for matches with similar values and interests — with the lead attributes being honesty and loyalty. In fact, nearly half say they would date someone who is not conventionally good-looking because character qualities are more important. Account managers take this and the client’s personal wants and needs into account when choosing potential mates. Seventy Thirty also offers supplemental services, such as life coaching, image consulting, and date coaching, to attract and keep an equally amazing partner. Many happy clients write in to thank Susie and her team for their help. A European CEO offers one such example. He was raised in a modest family environment by parents who wanted him to “stand on his own two feet.” He supported himself through college, worked his way up the ladder, and eventually took over his family’s business. Seventy Thirty successfully pairs high net worth singles with similar backgrounds and lifestyles. Another one of Susie’s clients, a neurosurgeon from Hong Kong, also remarked on how successful her experience had been. With members from all over the globe, Seventy Thirty experiences organic growth as members refer other members. While there is a substantial membership base in the UK and Europe, membership numbers are rising in places like Singapore, Hong Kong, New York, and Los Angeles. According to Susie, members are of all ages, lifestyles, backgrounds, and industries and have different relationship aspirations. Confidential and psychologically-backed, Seventy Thirty is among the most effective elite matchmaking companies. Thanks to a hardworking leader and team, successful singles are presented with an efficient way to meet their soulmate.